Noses are Not for Picking by Elizabeth Verdick. This book does directly with nose picking and how it is "yucky". Indirectly, it tells toddlers that "germs can make you sick" and that you should "Wash and dry. 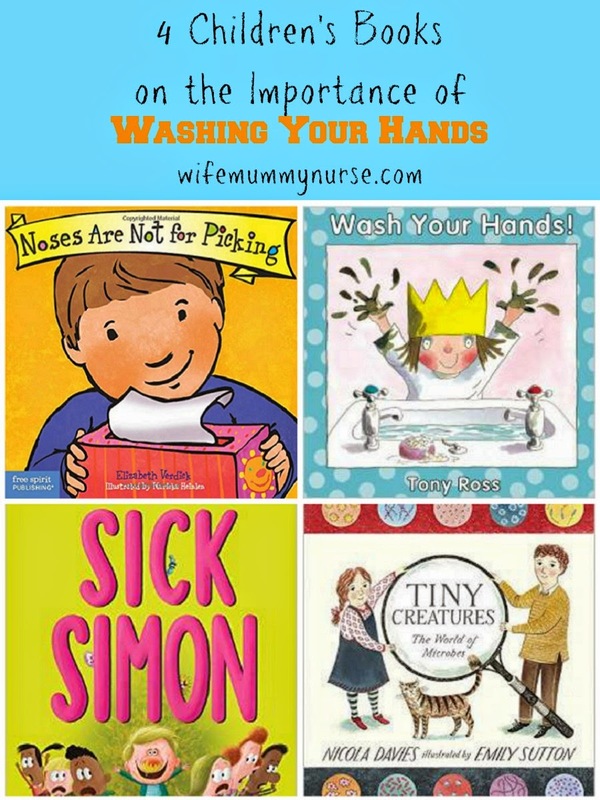 Tell those germs good-bye." I have adopted this quote for my daughter when she washes her hands and now she joins in and says it as well. Wash Your Hands! by Tony Ross. There was a little princess who loved getting dirty. The Queen told her to wash her hands before eating, which she did. As the story unfolded, there were four instances where the princess was told to wash her hands, and she wanted to know, "Why?" The maid is the one who tells her it's "because of germs and nasties", and they can make you sick. This was my least favorite book of the ones we borrowed. I hear "Why?" all day long, and I do NOT want to read it in a children's book. Note: I'm not opposed to hearing why, but I'd prefer more of an explanation in a children's book on the importance of washing hands. Sick Simon by Dan Krall. Simon woke up on Monday with a cold, but he did not care. It was going to be a great week; he went to his favorite place-school. He threw up, sneeze without a Kleenex, shared snacks with his friends, and shared his germs with all his classmates. On Friday, no one was there for the big game. On the way home, the germs thank Simon for all the nice work he did for them that week. They told him, "Thanks for the ride." Because he never washed his hands and never and never covered his mouth, he spread a lot of germs. He was declared a "germ hero." After the conversation the germs had with Simon, he started covering his mouth when sneezing, throwing his tissues in the trash can, and washing his hands with warm soapy water. By Monday he was all better. Tiny Creatures: The World of Microbes by Nicola Davies. Of all the books borrowed, Tiny Creatures had the most science (and happened to be my favorite). It explained that not all microbes make people sick, some even help milk become yogurt! I loved how it explained science in an understandable way. If I need to, in the future, I plan on coming back to this book for home school. Dial® recently came out with new products that I love using with my family to help wash our hands. Dial® baby body and hair wash. was developed with Pediatric Dermatologists, this tear-free formula is pH balanced and hypoallergenic, with no parabens or artificial dyes, for babies’ perfect skin. Gently removes environmental dirt for a head to toe clean. Dial® kids makes hand washing fun for all ages! Hypoallergenic, no artificial dyes, no parabens, pH balanced and gentle on kids’ skin! I was sent this product for the purpose of review. I like Purex Fabric Softner. I use it to soften towels when I hang them outside to dry. I like Purex Natural Elements Laundry Detergent. Great product! kristiedonelson(at)gmail(dot)com Thank you. I love their new Fragrance Booster -- makes everything smell so good. I like using Purex crystals so I can control the amount of scent on my clothes! My favorite is the Purex Natural Elements Laundry Detergent - Linen & Lillies, thanks! I love how affordable Purex is, and their fragrance boosters make my clothing smell extra fresh! I like Purex Crystals in their new liquid form. Dial's Foaming Hand Soap is my favorite. I like the purex dryer sheets! I like Purex Baby Crystals. They smell amazing and work wonders on my clothes! I like the free and clear. I love Purex crystals! They make my laundry smell great. We use Purex free and clear detergent.